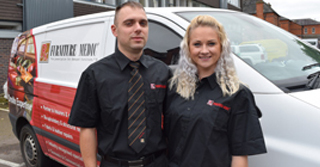 Furniture Medic Lincoln, a furniture restoration franchise of ServiceMaster, one of the UK’s leading and largest multi-brand franchisor, has been launched by a local couple with over eight years’ experience in furniture repair. Eligijus and Daiga Kleinovas, of Lincolnshire operate across Lincoln, Skegness, Boston, Mablethorpe, Louth, Market Rasen, Woodhall Spa and the surrounding areas offering all aspects of furniture repair and restoration, from French polishing to leather and upholstery. Furniture Medic is part of the world’s largest furniture restoration company, originally founded in the US in 1992 and is part of franchisor, ServiceMaster in the UK.